Ducketts Common, looking north from 'our end'. Real differences between then and now are many but some are stark. Back in the 40s and 50s we played in the street. Safely and all the time. Today's Ladder is crammed with cars on both sides of every road. Traffic is confined to the centre and where two way is permitted single file is the order. In our day cars were rarities. First car in my family in London was my grandfather with a 1937 Ford J Type. Two doors, four seats, a luggage rack on the back and flip out trafficators to augment the obligatory hand signals. No heating, no radio, no fresh air unless it was travelling very fast. Unlike the windscreen wipers which were powered by the manifold pressure – which falls as you speed up. So did the wipers! Tyres were so skinny you would think they would miss anything sharp. They did not and punctures were a weekly occurrence. They had also fitted well into the tram lines but these were mercifully disappearing when I was a toddler. And it was black. Where it wasn't rusty. The theory was that steel was so short in the war that cars were made of old cocoa tins. Why grandpa told me this I know not as his car was 1937! So until the early 50s there were almost no cars in the length of our road and most others. I recall some motorbikes and a few motorbike combinations. My mother took a very dim view of the idea of travelling in a sidecar – she said it with the intonation of Lady Bracknell deriding Earnest's original resting place. Some years later I did rise in one and must say I largely agree. But in those days you did what ws necessary. We bussed and tubed but I'll come to that. Our end of Frobisher benefitted from a long, six foot wall which protected the garden of the new house built on the bomb site opposite. 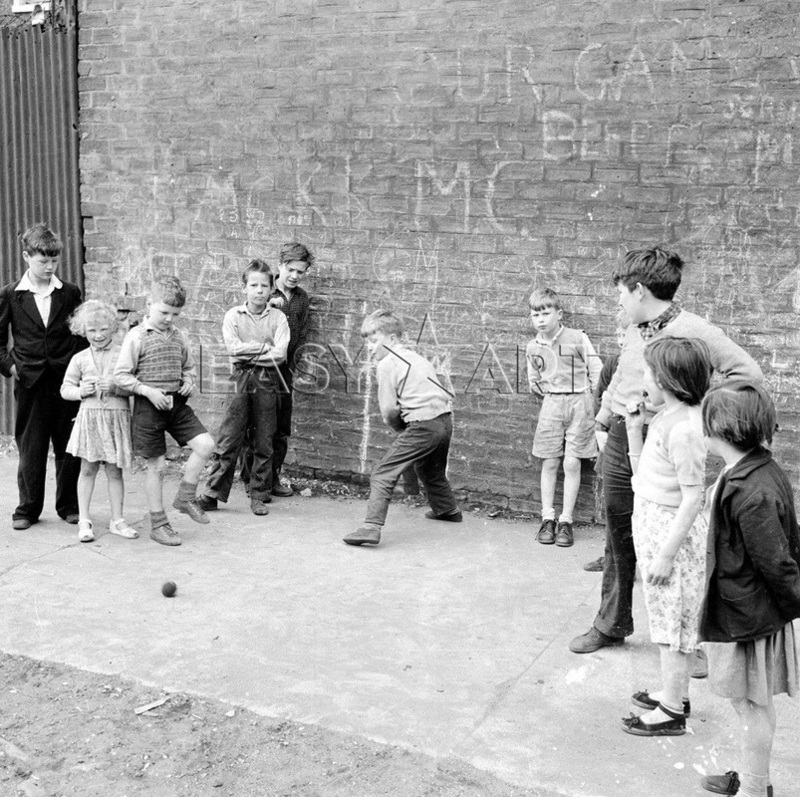 This provided a location for cricket stumps and goal posts chalked on the wall. By about 1952 somone had painted them in more permanently. To his credit the householder, Jack Sleigh, the Wood Green horsemeat man, never batted an eyelid. Given his handsome wife Eve was a bit posh he must have had a way with her too. So we happily played softball cricket and tennis ball football all day long. Intervals came about as the many tradesmen brought their wares to the street. Many into the 50s were horsedrawn and we would frequently have to clear the steaming piles from the playing area. If we were lucky the chosen householder would offer a penny for putting it on the garden. Unless it was the lady who lived at the last house on the opposite side of the road. No doubt she reckloned our scrumping of her apples and pears was sufficient recompense and for my part I have to admit she was indeed robbed. Play would also stop for injury time. 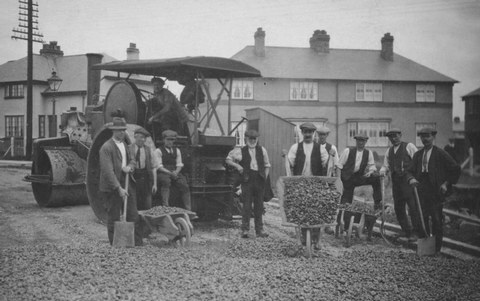 The pavements were flagged so not too damaging but from the late 40s the road was 'top dressed' This involved the replacement of the smooth tarmac with granite chippings, rollered into place at first by an actual Steam Roller. This would arrive on the back of a truck and provided great excitement for us kids. When it was replaced by a dull green London County Council green diesel job we lost interest. But the result of all those granite chippings was some pretty interesting pattern grazes and skid burns. Play would stop, the screaming child would be helped limpijng to his home or a neighbour who was playing locum for the day. The treatment was worse than the injury generally. Iodine was used for anti-septic reasons accounted for by the activities of the horses of course. If you were lucky the modern mum would use Germolene, later banned or re-launched for its apparently unnacceptable contents. Bandages were bits of old shirt, pants, vest or whatever and with any luck they had been recently washed. They were tied on tightly. As in tourniquet tightly and would stay in place just long enough for the first scab to form. Then they provided an interesting addition to ankle wear. Of course everything I have said so far applies to The Boys. The Girls played different games of which I had only a vague awareness. They involved chalk, the marking out of paving flags and much shouting, singing or other aggravating noise. Utterly at odds with the serious cries claiming the ball, the wicket, the catch etc. The game of cricket was especially interesting. And unpopular with many residents. It is worth noting that while the age range of children in the area was as varied as you might imagine there was also the matter of The Bulge. This burst of fecundity on the part of our parents, especially those whose actvities had been curtailed by the war, meant the number of kidd born in the later 40s was greater than before or after. We 42-45 models were outnumbered heavily as the 50s got under way. So we larger lads took advantage of our muscular advantage by hitting the ball further, higher and harder than the litte'uns. Targets varied – windows were supposed to be off limit but accuracy wasn't up to much. Gutters however were targets – and getting your shot to clear them, bouncing up and then down the slates was great fun. Of course they did not always clear the gutter as they came down which would necessitate the climbing of the fronts of houses – not popular! Otherwise they fell into the flower beds – it seemed always to be in those where the householder took some pride in their tiny front garden - not popular again! 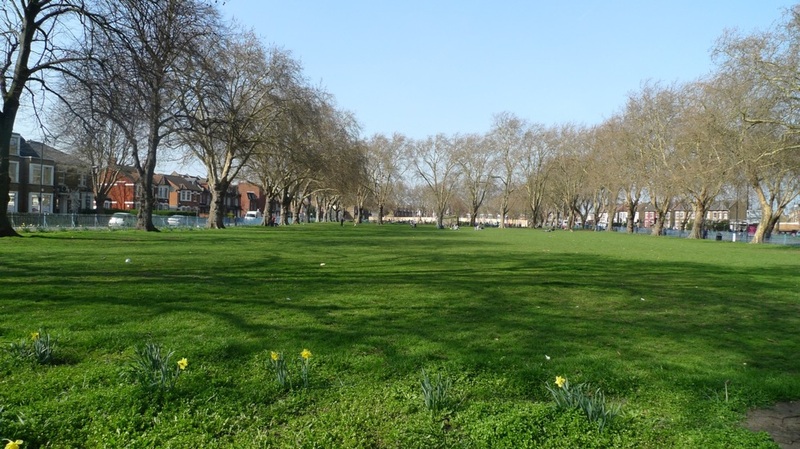 Also surprising since most of these patches consisted of bare earth or tufty grass – where they were not covered by motorbikes, motorcylce combinations or assorted junk. Yet somehow the ball mostly fell in the tulips or whatever. But this freedom was not to last. As the 50s opened the car began to appear and by 1954 we had our own outside. Indeed by the mid 50s few houses did not have at least one car out front. So our actvitiers necessarily concentrared far more on the joys of Ducketts Common. This, to us, large expanse of grass, surrounded by trees and a lethal spiked fence was a joy. It had always featured of course but inevitably was a spring and summer haunt until the car forced us to use it in the wet and mud. It was large enough for one serious game of cricket or football or two not serious games. Once again I am talking about the boys – I know not what if any use the girls were able or even allowed to make of the common. The games came in two serious forms – casual sides picked from available people and Inter-Street matches. These last usually involved some adult involvement by way of organisation but were hard fought. The football could descend into something approaching all-out war. The cricket inevitably less so but you did wonder sometime if the batsmen, never mind the bowler, was not actually playing the game but aiming to inflict injury. Mostly the cricket was played with a tennis ball but a few times each year the hard ball came out, pads went on and the dodgy state of the pitch – there was no 'table' – made life seriously dangerous. As I grew up Ducketts also provided much of my tennis playing. It started as ball boy for my father who played every Sunday, usually against a chap talled Towers. They played on the excellent red gravel courts – not unlike clay courts and far superior to the grey or green tarmac, of which Ducketts also had four. They played hard and fast tennis and being ballboy was an exciting and at time dangerous game. At the end of two hours they would adjourn to the Queens Head Hotel bar for a pint or two. My reward was a packet of crips and a lemonade outside. The crisps of course were Smiths, plain and with a twist of blue paper containing the salt. It was thus already possible to have unsalted cisps. Think on. As soon as I was able to hold a racquet father started teaching me to play. He was a technically capable player and made an excellent teacher, as he did for cricket too.But he was demanding. It seemed I was expected to serve overhead and at high speed from the outset. Weakness in the backhand ws not tolerated. Failing to return a hard violley because the racquest was blown out of one's hand failed to impress. I learned fast if not happily. But we all became hard hitters and competent tennis players. I sopent many entire days on roller skates. 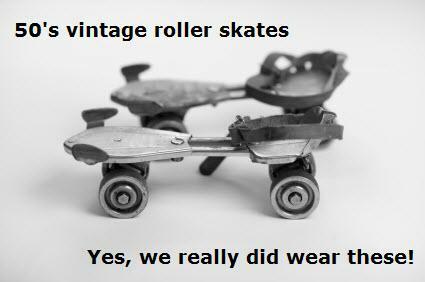 The first were steel wheeled beast that were noisy and dodgy but soon I had my Jackoskates, double width rubber wheels and proper roller bearings – whoo! These allowed speed, manouvreability and silence. Pedestrians who had never seemed all that sympathetic now claimed they feared for their lives. 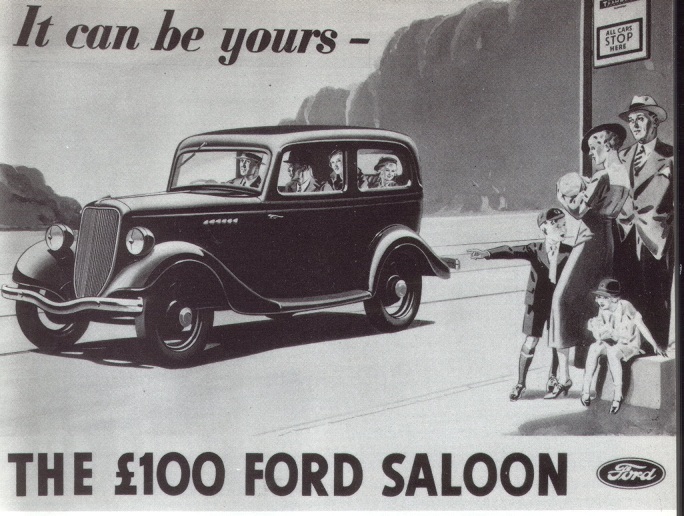 An ad for a Ford just like my grandfather's first which then became our first car. 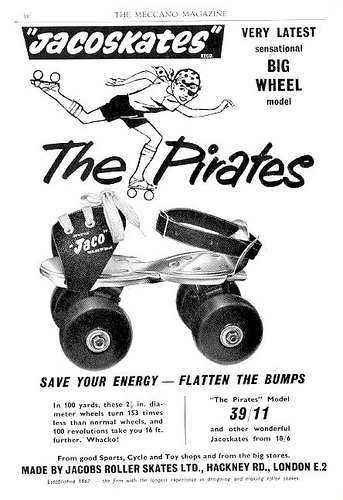 1950s roller skates - these are steel wheeled. BUT finally we got some Jako skates - double width rubber wheels!